Radio Frequency IDentification (RFID) enables automatic identification of products and shipping containers in production and retail. 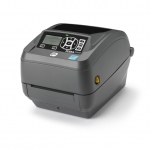 Our systems will create, print and automatically apply RFID tags. The tags comprise an RFID transponder – a microchip with memory where data can be stored, edited or deleted and also an antenna. RFID readers will read and decode the data. RFID stands for Radio Frequency Identification. This means remote identification by radio frequency. The technology is used by send-receive systems that can automatically and remotely identify or localise objects and also members of staff. These RFID systems are used in a diversity of fields – in logistics, for instance. 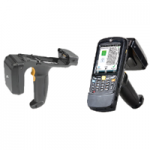 Every RFID system comprises an electronic data carrier (RFID label) and a reader (RFID reader). Both components have an antenna for communication of data. Data is communicated via electromagnetic waves. The reader generates an electromagnetic field. Two-way communication takes place should the transponder be located within range. The reader can now write data to the chip or read data in memory. Contactless process: Data is transmitted from transponder to reader/writer and vice versa via RF antennae. This requires no physical or visual contact. The RF signals can penetrate various materials. Not only does this allow for faster reading of goods, but it also facilitates reading inaccessible parts. Fast data exchange: The time delay between transmission and reception is negligible with RF transmission. Bulk reading: RFID readers are capable of reading large numbers of RFID tags simultaneously. 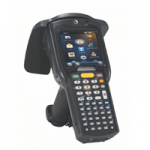 All the products on a pallet or in a shipping container can theoretically be read in a single scanning process. 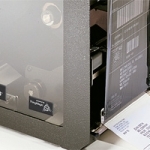 Virtually error-free: The initial read success of RFID labels approaches 100%. 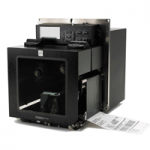 Additional reliability is offered by RFID systems that detect and eject faulty tags. Security through encryption: Data may be encrypted instead of transmitting in clear text, to allow access control. Robust: RFID tags are resistant to extreme ambient conditions such as high temperature fluctuations, heat, cold or moisture. Products that will later require special reworking or cleaning may be reliably marked using RFID. Reusable: As opposed to printed barcodes, RFID chip data can be edited and supplemented later. Invisible: The tiny RFID transponders may be inconspicuously integrated into most labels. Where are RFID chips used? Production control: In industrial manufacturing, RFID chip data may be used to document a product’s production status. Further process parameters may be specified based on this information. This procedure is widely used already, especially in the automobile industry. Traceability: RFID tags can store all production and source data, allowing unequivocal and complete traceability along the supply chain down to location and time of production. Inventory management: Libraries use RF labels, among others, to control borrowing and return of media through self-service terminals. 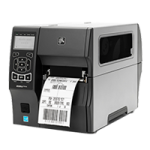 Store management: RFID may be deployed to automatically capture pallets at goods receipt, book them in the inventory control system and transport them to their designated shelf. Product protection: High-grade branded products use RFID transponders to differentiate between originals and counterfeits during authenticity checks. Access control and clocking: Many companies use RFID chips for automatic access control at entrances and/or to record staff working hours at designated terminals.